Digital citizenship’s endpoint is about sharing. It is a journey of along multiple pathways with many steps. To successfully navigate digital pathways as a digital citizen one needs to firstly understand their digital identity which involves managing their digital world (Figure 1). A fully informed digital citizen is then in a position to become a fully functional digital learner and leader who learns and shares. Beware of the send button. This click is the start of a student, teacher and school’s digital footprint and reputation. Digital foot print refers to the impression, traces or evidence data and information which remain after you have use any web tools or services of the digital world. Once individual students, teachers and schools have developed a greater understanding of their digital foot print, their journey of managing their digital reputation and citizenship begins in earnest. Dr Jason Olher at Ulearn, Auckland 2012 suggests “read, view and interact” which involves an understanding of bias and media persuasion. In short you need to be critical and reflective of your use of services in the digital world. Students “go places” in the real and digital world. Are they always safe? Are there places they should not have been? They “interact” on line and have they done so with appropriate netiquette, while aware of their digital foot print? Students also “publish and contribute” in some way each day by doing a presentation, a citation, a status update, blog post. He suggests there is a lot of solid learning happening in a typical digital day. This is their digital footprint and life. In relation to our role as a parent and teacher. No longer can teachers and schools be passive observer. We are in the middle of a paradigm shift in the way we live, learn and work in a digital world. Teachers and schools are not immune from being aware of their digital presence. A greater understanding of their web presence will help them guide students. It might be prudent for teachers and schools to have a greater understanding of their digital footprint and reputation through more direct engagement of managing their digital reputation. Personally, you probably have a Facebook account and maybe a Twitter presence, however, professionally do you have Linked In Account. Is there an up to date picture of you? Is it linked to a webpage or biography of your professional life? Do all teachers understand the delete button does not always solve the issue? It can take years to build a digital reputation and one click can set you back many years. As an educational institution do you keep technology outside of the doors of the school? Or are you a school that opens the door to technology for communication and leaning with in the school community? If your school would like to move towards the final scenario one suggested starting point is to encourage teachers and students to learn how to manage their digital reputation and in doing so becoming active digital citizens.Your digital footprint is not just about what you place online it is also about when you go digital, where you do it and how you go about it. It is probably no longer acceptable to turn a blind eye. In fact, avoidance can potentially be detrimental to your students, personal and school’s digital reputation. Digital reputation is the opinion that is formed when people examine or become aware of your digital footprint. Everything you do and say online will have an impact on your reputation. Your digital reputation does not need to be shape by others – you can manage it. It is an active process that involves both content creation and relationship building. Students and teachers, who understand they have a role in their digital foot print, can benefit from proactive digital reputation management. Many students have a digital footprint either related to their school’s online newsletter or what they place on social media sites. At Loreto Normanhurst our Extension History students use Edublogs for their learning. Recently one of our ex students informed us of a good news story. For a university task she was completing a digital footprint audit and her first “hit” was her history extension blog. She was very pleased with this reputation not least of which was because she was a history undergraduate. Perhaps students, teachers and schools should consider going a step further than just monitoring their digital reputation. The starting point is an audit of your digital reputation and then membership of an online Community of Practice (CoP). A Community of Practice, according to Jean Lave and Etienne , is a group of people who share a craft or a profession. Through their common interests they share common interests and collaborate. Communities of Practices exist in many aspects of life: runners gravitate to Cool Running Australia, Triathletes to Transitions. Educators are no exception and connect through formal communities such as Digital Education Research Network (DERN), through to the informal TeachMeets or personal and professional learning networks through Twitter and LinkedIn. Through your involvement in these communities you are starting to manage your digital reputation and embarking on a digital citizenship journey.There are several tips and tricks to help teachers achieve this and then be in a position to guide your students. This can be achieved by starting a blog or wiki, opening a collaborative learning group on Facebook, older students can use LinkedIn for careers, engage in mainstream digital communication, use Slideshare, Prezi, YouTube or iTunes to share ideas and finally obtain your own domain name to create a one stop shopping stop for your digital reputation. So the message is clear in managing our digital reputation, we need to move beyond being a digital lurker by collaborating and connecting with other friends and colleagues online by using the plethora of tools at our disposal. Once your students have their digital foot print reputation under control they might like to become a more actively involved digital citizen. Is there a difference between being a citizen and a digital citizen? Many agree that technology is being nomalised into everyday life and perhaps this should apply to citizenship as well. In the paradigm shift we are experiencing may we contend you cannot be a citizen without being a digital citizen – to be an effective citizen of the community you need to be an active digital citizen. Many scholarly and practical insights about digital citizenship can be gleaned from the work of Jason Olher (@jasonohler), Steve Wheeler (@timbuckteeth), Alec Couros (@courosa) and George Couros (@gcouros). Mark Pesce’s (@mpesce) work more recently through Moore’s Cloud shows how digital world does shape how we live, while George Siemens (@gsiemens) work with MOOCs and learning analytics reveal the fundamental changes that are happening with learning in our digital world. These higher profile digital educational leaders are supported by hundreds of educational bloggers who communicate, connect, collaborate and share as digital citizens, learners and leaders. Students, teachers, parents and schools would benefit from a more structured approach to understanding and managing their digital world. 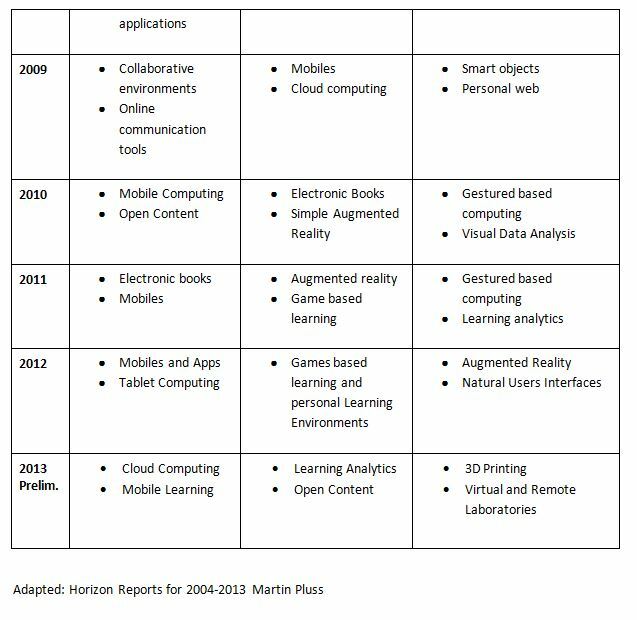 From personal experience the best way to see what is happening in the digital world is to closely follow the Horizon Reports as indicated in Figure 2. This table summarises the reports from 2004 – 2013 and provides considerable insight on closer analysis. There are a number of levels to citizenship involving personal, participatory and justice oriented decision making. In addition there are several steps you pass through as you become more actively involved as digital citizen. Personal digital citizenship involves individuals acting according to their beliefs, values and ethics as we make use of digital tools. This is how you engage with social media or how you ethically use web tools in the classroom for teaching and learning. Participatory citizens have moved on from being a digital lurker or observer and are becoming more digitally involved. Perhaps you can work on building collaborative online communities and Communities of Practice. 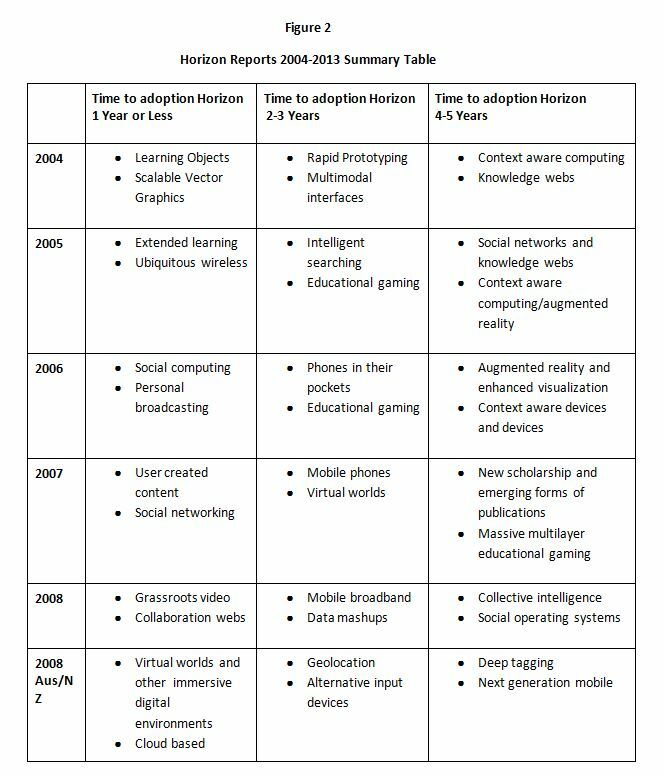 This process naturally happens as people adopt 21st century digital teaching tool and skills as indicated through the Horizon Reports and other avenues. Justice oriented citizenship raises the bar even higher and challenges students and teachers to devise solutions to problems in communities using digital tools to spread a message and improve the quality of lifeof communities. The latter will be demonstrated through a later example of a Youth Congress. 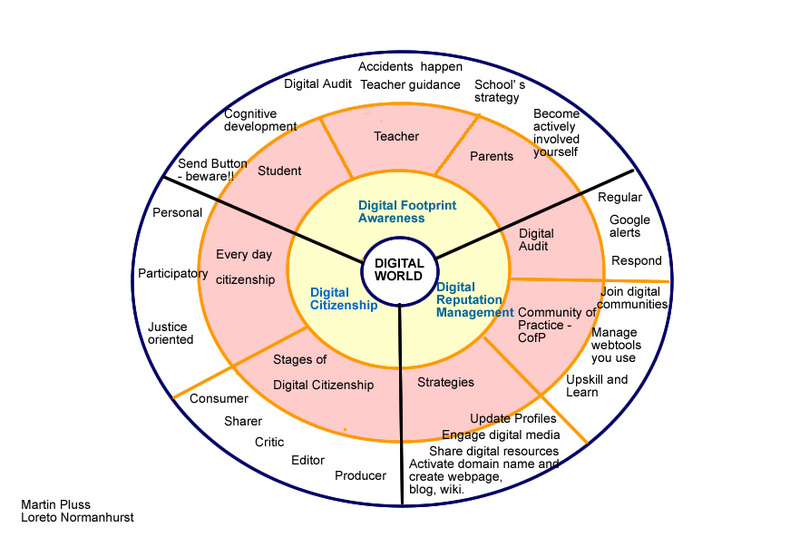 In this personal, participatory and justice based digital citizenship journey an individual or a school passes through several stages, representing varied levels of learning and digital leadership. Initially your digital life starts out as a consumer of information. As your confidence grows you start to share with others, perhaps even becoming a critic offering constructive suggestions. This is where the majority of people sit in the digital world; however, there is room for you to become an editor of content on the web shaping and curating information and ideas in a way that which may lead you to producing content. These stages will be demonstrated through an examination of the evolution of one school’s social media platform. As teachers we are learners and leaders. Our journey as digital citizens from understanding our digital foot print, to managing our digital reputation to the normalization of citizenship with the digital world is incomplete unless our citizenship is closely linked to our learning and leading in schools. Digital citizens need a framework to help understand digital learning. Bruce Dixon of the Anytime Anywhere Learning Foundation (AALF), suggests modern learners have the ability to access high quality content whenever and in whatever format they need it, have the ability to form networks and participated highly interconnected groups , have the ability to save and retrieve information in a variety of formats, have the ability reuse and build upon the work of others, have the ability to quickly find feedback from multiple sources, have the ability generate large amounts of data about our technological based activities and have the ability to operate in the same spaces as experts and professionals. The firstly digital citizens plan and evolve engagement with digital content. Digital citizens make use of wikis, blogs, a range of web tools and key school platforms such as WordPress, the Google suite or OneDrive. They also learn to ethically and safely remix content from the web which develops a culture of sharing at the same time showing respect for and understanding of both creators of and consumers of web content. Students curate existing content and create their own material in the process of learning. The digital world has provided new platforms to develop activism. Engaged citizens consistently reveal that ‘Actions speak louder than Like buttons through involvement in online communities such as Facebook groups, Taking IT Global or Project Futures. Teachers naturally have to take an active role in this sort of activism from both a safety and learning perspective. The digital world in which we live is providing a paradigm shift in the way we live, work and learn. In life and work we do things differently compared to only a few years ago and learning is no different. Fortunately many schools work to understand and develop best practice and leadership to shape our digital learners. The final component of digital citizenship is digital leadership. This is demonstrated through the digital leadership opportunities for students, staff and broader school community. The key steps in this process involves, communication, connecting, collaborating and sharing. Mark Pesce (@mpesce) in his uLearn Presentation in Rotorua New Zealand October 2013 ‘The sharing nexus: connecting, learning and 21st century educational environment suggest digital natives are now sharing natives. They understand connectivity is the way they can share and access information and people. Three examples indicate the success of this vision. Educators understand that learning is not a solo journey, though do schools as an institution completely understand this? In the same way our students share to enhance their learning so to can schools share to enhance what they do for their community. Successful professional development, via Personal/Professional Learning Networks (PLN) is demonstrated through the recent popularity of, TeachMeets the core of which is based on the principle of sharing lead in NSW if not Australia by @mesterman . Schools and organisation which organize TeachMeets are at the forefront of digital leadership. Planned organisied and implemented digitally TeachMeets are the grassroots examples of digital leadership. Schools which have not formally embraced TeachMeets have adapted the approach in staff meeting through their own short presentations , mini TeachMeets or even Ted X style talks to share and liberate digital learning to the broader school community. At Loreto Normanhurst two examples of adapting to changing patterns of learning and embracing the digital world view are worth sharing. In Year 10 for several years the school developed programs after the School Certificate in Term 4. Two years ago the school believed an existing program had served its purpose. Meanwhile the schools was in the third year of a 1:1 laptop program and the students were engaging with learning and external communities in a digital manner. The school leadership developed a Youth Congress (YCon) which adopted the structure and processes of the United Nations. The success of the program is in the way it has completely normalized the use of digital technology in the process of sharing information, ideas, and decision making. The year group was broken into eight countries and had a series of asks, meetings and decisions to be made over a week of learning and engagement of YCon. There were country based issues which were addressed and acted upon, worldwide thematic issues such as climate change, poverty , terrorism and the like were examined and required representatives for each country present and defend their viewpoints. “Social media is changing the way people interact, present ideas and information and communicate”. In 2009 the provision of first iPads and the change over from Blackberry to iPhones for the school Leadership Team for the Principal, Deputy Principal, Principal Executive Assistant, Director of ICT and Dean of Learning Technologies started the process of engagement with social media. In the process of exploring Apps we encouraged each other to explore the potential of social media through the iPhone and the iPad. The launch ‘happened’ through video of a key school event – Loreto Day 2011. The first post was an immediate success for the whole school community. With this success came more questions and refinement in areas of explaining our vision, privacy, copyright, moderation, hashtags, the use of photos and videos and re-posting to other platforms. Over time we have added , multiple platforms Twitter, Facebook, Instagram, LinkedIn, Vimeo, Youtube, Edmodo and Four Square most with the name @loretnh. By way of example Loreto’s Leadership team worked diligently at learning about what they did not know. For example, we were conscious of the need for policies and guidelines though there was limit to crowd sourced support on this front. In fact one of the NSW educational governing institutions contacted the school for our policies and guidelines. We would attend copyright workshops through the copyright agency and ask questions about social media which they could not answer and the following years there were specific courses made available. We kept moving forward by “doing” step by step – planning, doing, evaluating, reviewing and doing It was relatively simple to create our individual accounts though it was more difficult to claim names for school based accounts and sub accounts. This involved a deliberate planning process of generating emails, selecting a core username and second tier backup usernames. Then there was the planning for potential scalability with in a social media platform and across multiple platforms. The handle @loretonh is the top level twitter account and the school has sub accounts such as @loretoprincipal, @loretodeputy @loretolearning,@loretopastoral and then house and faculty accounts. In this model the social media platform evolved by necessity through doing. By being an early adopter this was the best pathway for our school though schools developing their own social media platform now may have a different pathway based on the experiences of others have By having a core group of people we were able to monitor manage a step by step process dealing with all the planned and unexpected outcomes. Some argue there is no such thing as an original idea just a combination of ideas used in varied contexts. These ideas on digital citizenship have been developed through my experience as an early adopter of technology and a classroom teacher who likes to be up-to-date and learns by doing and sharing. My early use of Facebook, Twitter, My Feedly LinkedIn and WordPress added to and replaced the earlier adopted Web 2 tools such as FriendFeed, Bloglines, Google Reader and html developed and FTP uploaded websites. Every step of the way through communicating, connecting, collaborating, caring, cooperating and sharing with hundreds of people in the digital world the following ideas of digital citizenship were suggested for your consideration:- digital foot print, digital reputation, the normalisation of digital citizenship digital learning and digital leadership. Other related terms can be linked in or even considered as core headings themselves such as digital identity, digital normalization, sharing natives or digital natives. At some point there needs to be a line in the sand. The final line has been drawn – for the time being – though the journey continues.